Apparently being smashed into the wall while playing basket ball, or hitting my head on the playground while running from my children is not good for an already fragile neck and back. I visited the chiropractor today and he adjusted my very sore body, working to put it back into alignment. He recommended to me that I stay off the playground or away from the dangerous areas. And, for awhile I do, but then I end up running in a rousing game and before long, an adjustment is needed. This morning as I prayed asking God for an overall life adjustment He led me to Hebrew 2. I haven't read this chapter in awhile, so I guess God figured it was time. In verse 10, it says this: "It makes good sense that the God who got everything started and keeps everything going now completes the work by making the Salvation Pioneer perfect through suffering as he leads all these people to glory." I'm getting the idea that suffering is part of the picture in scripture. Life did not come easy for a lot of people. In fact for most everyone, adjustments took place, and as they went about their life, some of them being smashed against walls, or bumped on the playgrounds, they had to continue to come back to God for an adjustment. It was a lifetime process for them, and that's exactly what it is for me. A daily adjustment. My heart, my attitude, my mind, my soul, it all has to be daily adjusted to God, aligned with Him, set to His timing and His way. I have found that sometimes I am way off balance. But, His grace and mercy towards me is infinite. So, He is my Adjuster. I really need an adjustment today, Jesus! I know You are working through me, and I am leaning into You to trust that process. I need You to Say That Again to me, You will complete the work, and it makes good sense! My husband and I are faced with some tough decisions. As we talked on the phone today, and he discussed the plan for the next few days, my heart ached. I could tell that his heart was in the same place, and we both were crying out to God for a miracle. We have been crying out to God for some time now, for our financial situation is not good and it has been hard to hang on. We have made major cut backs, and it looks like we will have to make more. As I brought my heart and my anxiety before God this afternoon He directed me to Isaiah 49. It starts out by saying this: "The moment I entered the world he named me. He gave me speech that would cut and penetrate. He kept his hand on me to protect me. He made me his straight arrow and hid me in his quiver. He said to me, 'You're my dear servant, Israel, through whom I'll shine'. But I said, 'I've worked for nothing, I've nothing to show for a life of hard work. Nevertheless, I'll let God have the last word. I'll let him pronounce his verdict.'" This is how I am feeling today. "I've nothing to show for a life of hard work." I realize that is a pretty big thing to say, for in reality, we have so much to "show" for our life. We are coming up to thirty years of marriage, we are blessed with four sons, one daughter, three daughter in laws, and two grandchildren. We have more gains than losses. God has surely kept us in His hands, cared tenderly for me, and for everyone in my family. Yet, here I am feeling like I am on the edge of loosing my stuff. I have to ask myself what that means for my calling? He has called me to speak for Him, even in the midst of my trials. I know God has promised me many things, mostly to keep me, still I am faced with fear. Further in this chapter I read this: "God comforted His people. He tenderly nursed his beaten-up, beaten-down people. I'd never forget you--never. Look, I've written your names on the backs of my hands The walls you're rebuilding are never out of my sight. Your builders are faster than your wreckers. The demolition crews are gone for good. Look up, look around, look well! See them all gathering, coming to you? As sure as I am the living God--God's Decree . You're going to put them on like so much jewelry, you're going to use them to dress up like a bride." He is saying to me that He is never going to forget me--never. And, I do know that. But, oh, there are days that my faith wavers. I have days that I come before Him and ask Him with a shaky voice to just get me through the next hour. There are days that I question if I misunderstood what He has promised me, or if I have made the wrong choices and now I'm paying for that. I forget what He has said to me. I'm human, and I need Him to lift me up so that I can Look up, look around, and look well! I need Him to show me the builders coming and gathering around me. I need Him to be my Strength! Say That Again, Jesus, You have called me to shine for you, to speak for you, and to step out in faith. You have my name on the back of Your hand, I'm going to keep looking up, looking around, and looking well. As I drove down my hill this afternoon to go to another group at our ministry house the glorious sun reflected off the snow that was so tenacious this morning. It was warm, and beautiful outside. I smiled as I drove down the main street of our town and a gentleman walked along the sidewalk in shorts, and winter boots. " Huh, I'll have to try that sometime." I mused to myself. The sun not only shines tomorrow, God reminded me, but this afternoon as well! Say That Again, God, The sun is shining today, and I am feeling warmer. It is all because of YOU. Thanks for the reminder. I woke this morning to lots of snow, too much snow for Spring. The calendar tells me that it's Spring, but the weather is insisting that it is still Winter. As I drove down our hill for a 7:00 group, I found it challenging to thank God for the snow. I wanted to remind Him that He SHOULD be sending us sun and warmth, because the calendar is telling me that it is Spring time now. He reminded me that HIS timing is perfect and that I will feel better as soon as I adjust my heart to HIS calendar and not the one on my phone! Ouch! Okay, so God does not consult the calendar on my phone to see if He should let it snow. As much as I love summer and sun, I am finding that God is speaking to my heart today and asking that I see Him in the Spring snow. He Has kept me through the cold days, when I've been triggered by snowflakes floating down to meet my lashes. His Robe continues to be wrapped around me to warm me and clothe me and remind me that He is a continual flood of Renewal, Restoration, and Revival. My job is to step out in the Spring snow and walk in faith. I watched my kids play in the snow a lot this winter. They went sledding, made snowmen, and snow angels. Yesterday, I mentioned that someday, I too would make a snow angel, someday. It is a goal of mine, a sign of snow restoration! God is in constant motion, always restoring, renewing, reviving. I am in constant need of His gifts. My heart is open to Him, receiving what He has for me, healing, loving, hoping, giving, being filled with His Spirit! Say That Again, Father God, it's all about You ,Your timing, Your Way, and Love. I received a lovely piece of chocolate in the mail. Spicey chocolate. It's been sitting on my dresser for the right time, today was that time. I could feel the moment coming on, and I knew I was going to need to eat it, probably all of it. It was wrapped in red cellophane, and even the smell of it made my mouth water. I sat on the floor to eat it, in our bedroom. And, it was spicy. Dark chocolate with a bit of pepper, melt in my mouth smoothness. Perfect. The Spicy Chocolate was my small blessing today, another rainy day, so it was a blessing to have it. I needed it. Um, I'm up for more!! I didn't stop at one bite, I ate it all. And, just at this very second I realized what a big gift that actually is, I ate the entire thing and I didn't feel bad about it at all. I didn't even think about it. As my reader, you might be thinking "So?" For me, I just made a connection. Back to being a kid, I was not ever allowed a lot of candy. I use to sneak candy, hide candy, even steal candy. And, then I would feel guilty. There have been times as an adult that I would think about all of that while eating candy. Today, I had some time to think about forgiveness. And, some time to think about accusations and repentance. As I thought about the root of accusations and where they come from, it brought me back to the enemy and his constant lies. The enemy is the accuser, the father of lies. But, God, He is light and He calls me into a life of confession and repentance and light. When I start to hear the accuser, God calls me into the light and asks me to confess what I hear and give it over to Him, and speak truth. Even something like eating a piece of candy! God brings healing to all things, in every area of my life. He restores and renews ALL things. He wants me to enjoy my spicy chocolate! I have listened to the accuser in many areas, and I want to bring all of those areas before Him and repent of that. I think there are sometimes areas I am not aware of, those are the blind spots behind the wall. God is showing me. Say That Again, Jesus, I am listening to Your truth today and walking Your path. You are the Way! It may be a little presumptuous of me to be writing this at this time, considering the fact that I still have a wall in my life. I think I've only allowed God to remove a couple bricks, well, maybe a few more. But, I picked up a couple of them and put them back too. I have managed to add some cracks to my wall from the bottom up which I feel is going to come in very handy in the end. At some point, it may be like the Jericho Wall, if I walk around it enough times, it will just come tumbling down. At that point, I can either sweep it all away, over to Jesus, or rebuild the wall! I've been praying for a long time now that Jesus will show me beyond the wall. I've been praying for Him to reveal truth to me and for His continued leadership in my life. I've been praying for Him to show me my blind spots and shine His constant light in all areas, knock down the wall, Jesus! It's been a lot of work to allow Him to take out one brick at a time, and peek behind the wall. Today as I looked behind the wall, it amazed me to see His revelations! I'm amazed, again in my life, because His love to me never ceases. I'm amazed again, because of the way He created me, wonderfully and intricately made! I'm amazed, again, because He has created me like a puzzle put together complete IN Him, and His love for me is endless. I'm amazed, again because as scattered and unorganized as I am, He has it all together, a purpose and a plan for my life. He knows me from the beginning to the end and calls me good IN HIM. I'm amazed, again, because as lost as I felt as a child, He found me, freed me, renewed me, restored me, and revived me. He KEPT me, loved me, and set me on a journey of discovery to fashion a path of recovery and hope for myself and others. I am amazed! So, my peek behind the wall was joyful, mystical, painful, incredible, scary, adventurous, and hopeful. Whew! and that was just a peek! Okay, God, keep talking to me and Say That Again. You are the Author of all TRUTH. You wrote the story I am living, and I am, really am amazed by You! This morning I turned to Psalms 27, a chapter that has been a favorite of mine for many years, and I read the second part of the first verse, "The Lord is the strength of my life; of whom shall I be afraid?" Good question! And so, I know that without my Lord, I am weak. Obviously, one only has to read a couple of my posts to come to the conclusion that I am weak and do not have life together on my own! I believe that The Lord is my strength and I am calling on that strength today. I know that I am weak without Him, there is nothing in me, I am but a puff of air. But, with the Spirit of God, moving and soaring within me, all things change. He is my Counselor, my Physician, my Friend, my Leader, and my Source for all things. When I am walking through the valley of darkness, He is my Comforter and my Light. When I have doubts, He is there to reassure me. He is the One that fights for me when I am too weak, the One that holds me up when I cannot stand, the One that wraps me, and the One that has me Captured. Say That Again, Precious God, You are Strength through the valley, and on the mountain top. You are strength always, and I am weak without You. We received a gift card to an Italian restaurant for Christmas. We decided to use it for dinner last night. We do not normally eat a large dinner. We are more the fruit and toast kind of dinner people, or for me I am frosted mini wheats. My husband has a protein shake. My kids eat lots of oranges, bananas, apples, toast, and raw veggies. The kind of foods I don't have to cook. It works out pretty well for our busy schedules. Anyway, last night was different, we sat down at the restaurant and my family ordered pasta. I ordered soup. We had a very nice time eating and enjoyed just being with each other and away from some of the stresses of the week. I enjoyed it a lot. My kids ate everything on their plates. As soon as their plates were cleared away, my son started to complain that his stomach hurt. He wanted to leave right away and go home. His patience was wearing thin, and he couldn't wait to get out to the car. As he pulled himself into his seat, he grumbled more and more about his aching belly. Our daughter was chatting the entire time as well about her candy and as we turned the corner to pull out onto the street her candy flew out of her hand and disappeared somewhere into the back of the car. She began to wail. Just at that moment our son announced that he thought we should pull over because he was pretty sure he was going to throw up. My husband took a quick turn into a parking lot and stopped the car. Our daughter was still moaning loudly about her candy, our son was desperately trying to get his seat belt off, as I was turning to help him. My husband quickly making his way out of the car to also assist. Soon, our son was standing on a patch of grass bending over, burping dramatically, my husbands hand on his back. Our daughter, still hunting, with my help, for her candy, her tears streaming down her face as our efforts seemed futile. Finally, our son felt better, having decided that he just needed to burp loudly. My husband lifted the seat and found the long lost candy, relieving my daughters anxiety. And, we were back on the road to home, laughing over our side trip in the parking lot. Who would've ever guessed while sitting in the restaurant that we would've gone to the parking lot so quickly? We were delighting in such good food, and company, and then suddenly calamity seemed to hit. Both kids were in their own trauma's and needed emotional support, healthy back up. Someone to walk them through, and be with them. Someone to get them back on the road again. Someone to talk them through the crisis. This is what God does. He sends support, wise people to talk and walk me through when I'm in the parking lot. He Himself is there to put His hand on my back, to hold me up when calamity strikes. He never leaves my side, and when I get back on the road, He is the One driving. It's a good thing. Jesus, Say That Again, I know You are always with me, I know you will never leave me or forsake me! Thank you for being in the parking lot. As a child I use to love to go to my grandmothers house. She lived in a pink house on a hill. She had a huge back yard with a giant garden and I would love to pick her tomatoes right out of the garden. She also had a very large lilac bush in her back yard, and I remember the smell of the lilacs being so sweet and fragrant. Behind the lilac bush, along the fence was a massive maple tree and in this tree was the tree house. I loved being in the tree house. I could see over the fence into two of the neighbors yards, and I could see all of my grandmothers yard. I could be alone and I could be safe. Nobody came into the tree house; it seemed as if nobody really knew about it, and I liked it that way. It was my tree house. I use to take my books into my tree house and read. I spent a lot of time at my grandmothers house in the summer, so summer days in the tree house, in the sun are a fun and pleasant memory for me. I even remember having my dog with me, high in the tree. I have often thought ,as an adult that I would like a tree house. We have a lot of trees in our back yard, and if we had a tree house, I think I would spend a lot of time reading and playing in the trees. I would eat fudge bars there, and banana splits. I would have slumber parties. So, today, I am thinking a lot about tree houses. Childhood tree houses, and a possible future tree house. I'm thinking about my own children and how much they love tree houses. I'm thinking that even though I am 49, I still am not too old to have a tree house, with a refrigerator, a heater, and a bed. I know, it sounds elaborate, but it has to be for someone so old! Many years ago my husband gave me a quilt for Valentines Day. It was bright with big squares on it, and very soft. I loved it. It rested on our bed, and it rested on the chair, and it traveled with me when we went on trips. I wrapped it around me in the cold winter months during my early mornings. Eventually, I began to notice that the material was wearing thin, then little tears were happening. I'd stitch them up. Soon, I'd have big rips, I'd stitch those up too. After awhile, I put the quilt away, fearing that it would be a pile of rags if I kept using it and I didn't want that. I recently gave my quilt to a friend, giving her full permission to cut it up and make it into whatever she wanted. She's talented and I knew she could use it to further her talents. She sent me a text last night with a picture of a scarf, she made my quilt into a scarf, for me! She took an old ragged quilt and made it into something new and lovely! The best of the best, as she said. Now, when I wear the scarf, not only will I think of the gift I received from my husband so many years ago, but I will also think of the gift I have received from a dear friend. The renewal of something that is dear to me. Yesterday afternoon I came home after visiting with some friends and I found my family camped out on our bed. My husband, both kids and both dogs. It was a lovely sight, except there was no room at all for me! We have a bench at the end of our bed, and I made myself at home down there, and spent a little time with Jesus. I've been needing more time, because I've been feeling like an old quilt. I've been feeling like I need to run back to the Throne constantly and be renewed, and have the rips in my heart sewed back up. As I was on the bench, in the presence of Jesus He reminded me of Proverbs 3. In this chapter there's a great verse that says this: "Trust God from the bottom of your heart; don't try to figure out everything on your own. Listen for God's voice in everything you do, everywhere you go. He's the one who will keep you on track." In the quilt of life, my quilt, I know I can't figure everything out. Only God has the pattern, and trusting Him is the answer. Trust is big for me, so I have to keep coming back to Him and giving myself to Him and confessing to Him, and he sews up the wounds in my heart. And, I keep learning. And, He is making a new quilt for others to see with His name on it, His stitching, His testimony, His love. It is stamped with His renewal and restoration. Jesus, Say That Again, you are the quilt maker! I was given a little devotional book that I've been reading. This morning, I read this "Instead of imagining how you might respond to terrible things that could happen, draw your mind back to the present and take refuge in My presence, I am much like a mother hen, eager to cover you with My protective pinions." For me, it can be easy to sometimes wander off to the future and "wonder" what I would do in a disaster. So, I found this statement to be helpful for me, and His words are a good reminder to me to Keep Him as my Rock and steadfast Redeemer today, right now. I don't have to worry about tomorrow, and yesterday is gone.... So, it is my prayer and my confession today that I need Him to keep me present. He has always kept me in many ways, He has kept me safe and secure, He has kept my soul. Now, I am looking at Him and hearing His word and wanting Him to keep me in today. There are times that He will ask me to look back and maybe even look ahead to plan. But, right now, today I am here asking Him to keep me in today. Jesus Say That Again today, draw me into You today and keep me with You today. Remind me of Your presence on this day and cover me. We have two dogs. The Stinky Dog, and the naughty dog. They both go outside in a dog run to poop, and if we don't get it scooped up every day; it can get pretty stinky. This morning, I got to visit with several ladies and our conversation reminded me of the value of having a poop scooper. I can get a lot of stink in my life sometimes, it's called sin. And, God is like a poop scooper, He scoops it out of my life everyday. I know it's a stinky analogy, and we laughed about it this morning, but it was very fitting for our conversation and so true for life. But so often, I don't want to look at sin for how much poop there is and how stinky it gets. I need God, the Poop Scooper. He calls it what it is, and He takes it. I know that everyone has issues. I know I do. Some people like to pretend that they don't, and others point fingers. I've been in both places. Either way, it's an issue. I know that God scoops me up either way and loves me for Who I am, not for what I do or don't do. He cleans the stinks off and washes me anew. He brings a freshness and a beauty to my heart that gives me hope. Jesus, Say That Again, You are the Poop Scooper, You clean me up every day and I live IN You. It's a good thing. I went shopping with a friend to the thrift store. My office needed a couch, because my daughter in-law is about to start a group in there and she needs places for the ladies to sit. So, my friend and I headed out today on an adventure. It really didn't take long, mostly because I like to be quick when it comes to thrift stores. The first one had nothing, so we sprinted over to another one where we found a great little couch that fondly reminded me of an old lady. It sat low to the floor and was decorated with bright yellow and green flowers. When we sat down in it it was like visiting an old friend. And, to help make the choice even easier for me, it was only 30 bucks! I promptly grabbed the tag, went to the register and paid for the old yellow couch. It then occurred to both my friend and I that the old yellow couch would have to fit in my truck! We drove around to the side of the store, and out the door came a man with the old yellow couch. I asked him if he thought the couch would fit in my truck and he said "no". I did not find that answer to be an impressive answer, so asked again. "Will that couch fit in my truck if I put the seat down?" This time he said, "maybe". He and I picked up the couch and proceeded to shove it in the back of my truck. We got it in and he commented that he did not think the back of my truck would shut. But, it did. So, off my friend and I drove on our next adventure: getting the old yellow couch out of the truck and up the stairs into my office! It all happened, as it always does, as I'm learning, because God has said it will happen! God said "I will expand your territory." and that is what He is doing. God said, "I will never leave you or forsake you" and He hasn't. God said, "I am here to keep you." and He has done just that for me always. God is my adventure, when I am with Him it's just like I'm visiting an old friend. There's a fondness, and safety, I'm drawn to Him with a familiar love. Sometimes it's not comfortable, it feels like I'm being shoved into a small space, like the old yellow couch, but always He is with me. Jesus, continue to Say That Again. I know that You will, because everyday You do, and every day I ask You to. Say That AGAIN! 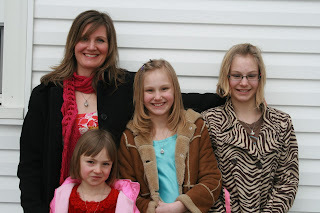 Each of these women are Daughters of the King, they all showed up today to be on our video for the crown necklaces. Each of these women have touched my life in some way. We are connected by God, and by a Crown necklace. They have all received one, and many of them have given away at least one necklaces or several necklaces. They all want to spread the good news that we are stunning crowns, captured in the hands of God! I want to tell other women that because I am His daughter, He has wrapped me up, hedged me in, crowned me like a stunning jewel and announced that I am His! Free to dance, love, sing, and live my life HIS WAY. So, ladies, wear your stunning crowns with honor, give them away freely, speak openly, and Say That Again and Again "We are Daughters of The King, stunning crowns captured in His Hands!" Today is another big day for our ministry, we are making a video for Crowned by The King. I'm counting on the Spirit to do His part, which is speak through me and tell of the amazing ministry that He has done in our community by crowning us as Daughters of the King. I spent time praying about this with God this morning, and I also brought to Him my stressful week, again. He pointed me towards Isaiah 41, and my eyes were drawn to these verses first: "Who always gets things started? I did, GOD. I'm first on the scene, I'm also the last to leave." "Don't panic, I'm with you. There's no need to fear for I'm your God. Ill give you strength, I'll help you. I'll hold you steady, keep a firm grip on you." And, then, just in case that verse isn't enough, He reminds me again a couple versus down; " I'm telling you, don't panic. I'm right here to help you." Okay, okay, I get it. Or, at least I should get it. God does not want me to panic. He wants me to rest IN Him, His strength. The video is HIS, He will do the speaking. The stressful week is His to deal with, not mine. His purpose is being worked out in my life, the lives of my family, transformation is in the making. In fact, He even said so, at the end of this chapter I read this: "I'm transforming you from worm to harrow, from insect to iron. As a sharp-tooth harrow you'll smooth out the mountains, turn those tough old hills into loamy soil. You'll open the rough ground to the weather, to the blasts of sun and wind and rain. But you'll be confident and exuberant, expansive in The Holy of Israel!" Say That Again, Jesus, You are telling me not to panic! You are telling me to rest IN You, keep saying it to me, and I will listen! It's been a stressful week. The coffee pot broke, but that is not the reason the week has been stressful, although, some friends that know me may consider that as being part of my stress. The coffee can is also empty and I received a text this morning saying that we needed to shop for more coffee, this is not the reason for my stress. We have bigger issue. Money issues, family issues, business issues. Issues like God is truly doing what He says He is going to do--Penetrate my heart. My husband asked God to enable him to trust Him more, so what does God do? He stretches us more financially, thus giving my husband ample opportunity to trust Him more. Our extended family is challenged in many ways and we are watching them live in pain. I feel pained. Both my husband and I spend time praying to God for their relief, and for answers. This morning I read about the Light dispelling the darkness. Where God is there is no darkness. His Light shines in all the places and brings the light, ugly darkness goes away, yet still there can be a cost to sin. Still stressful weeks exist. But, with the light, we handle the stress with prayer, step by step with Him. I am praying for His wisdom, His discernment. I know that as He probes deeper into my life, I need Him to give me all of these things. His safety wraps me securely. There's a lot going on right now. I'm glad it's Friday. I guess I better go hunting for a coffee pot, and some coffee. Jesus, Say That Again, Your light dispels the darkness, and with You I can deal with the stressful weeks. You are penetrating my heart, teaching both my husband and I to trust deeply. I love you Jesus.